The turnout of voters with Serbian citizenship in Banja Luka, Bosnia and Herzegovina, was 70.14 per cent by 2pm. Banja Luka is the administrative centre of the mostly Serb entity Republika Srpska. 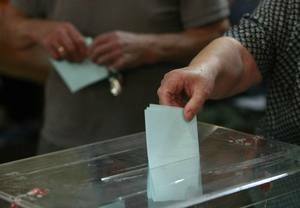 Of 721 voters registered at the polling station in Banja Luka, 505 voted by 2pm. The Serbian State Electoral Commission, RIK, does not yet have data from the second polling station in Bosnia’s capital, Sarajevo. President of Republika Srpska, Milorad Dodik, voted earlier today. Dodik, who holds dual Serbian and Bosnian citizenship, told the press this was his first time voting in a Serbian election. 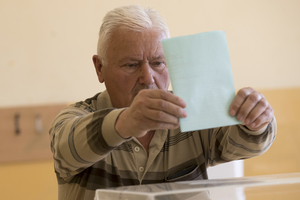 Zeljko Bodrozic, member of the Republic Electoral Commission in Kikinda, a small town in Vojvodina province, said that numerous irregularities had been reported across a dozen polling stations in Kikinda. Bodrozic told Beta news agency that unknown persons were checking in front of the polling stations whether citizens are voting, and that they have voting lists, which are banned. He explained that police had responded to one case of suspected vote-buying. In the southern municipality of Cajetina, home of presidential candidate Milan Stamatovic, the turnout was 40 per cent by 2pm, Serbian media report. This is substantially higher than the national turnout of 29.94. A little behind Cajetina, but still ahead of national average, are Nova Varos with 37 per cent, Kosjeric with 36, Bajina Basta with 33, and Arilje and Priboj with 31 per cent. Serbian media quoted local coordinators of the State Electoral Commission, RIK, saying that no irregularities have been recorded in those towns by 2pm. Serbian NGO the Centre for Transparency, Research and Accountability, CRTA, announced that turnout up until 4pm was 37 per cent, which is 2.6 percent less than in the early parliamentary elections of 2016. The Serbian embassy in Podgorica, capital of Montenegro, told Beta news agency that 50 per cent of the city’s voters had cast their ballots by 3pm. 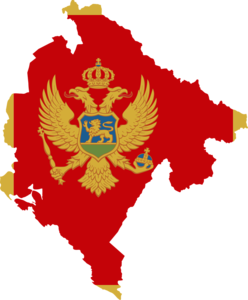 There are 750 eligible voters in Montenegro, and four polling stations in Podgorica, Sutomore, Berane and Herceg Novi. Leader of the party Nova Srbija [New Serbia], Velimir Ilic, said today that his party will not recognise today's presidential elections as legitimate. Ilic said at a press conference that the elections have taken place in the midst of a "series of irregularities", and that, among other things, ballots have been filled in outside the polling stations. Nova Srbija was until recently in ruling coalition with the Progressive Party, and now is supporting opposition candidate Vuk Jeremic. A delegation of the Russian Central Election Committee noticed no irregularities in today's presidential election, said delegation chief Vasily Likacev, Tanjug news agency reports, quoting a statement in Tass. Likacev said he had visited eight polling stations, and noticed "voters were more active in Vojvodina [Serbian’s northern province]”. "I like how voting is organised. I asked observers about irregularities, and no one reported anything,” he added. The Centre for Transparency, Research and Accountability, CRTA, an NGO that is monitoring the elections, confirmed on Twitter that a voter from Leskovac, who visited his hometown from abroad to cast ballot, discovered at the polling station that someone had already voted instead of him. The head of OSCE’s mission to Kosovo, Jan Braathu, said he was satisfied that the Serbian presidential elections in Kosovo were going smoothly. 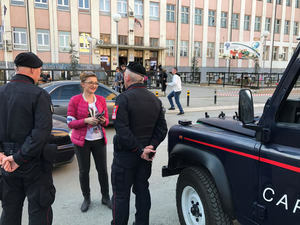 Kosovo police said that not a single “specific incident” had occurred so far during the elections, and that no reports had been filed to challenge the legitimacy of the process. 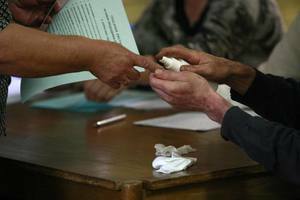 Voters in Kosovo went to the polls jointly, organised by the Serbian Progressive Party. Employees of public companies and the state administration in the Serb-populated northern Kosovo town of Mitrovica were gathered and organised by their directors and managers to go to the polls. The Centre for Free Elections and Democracy, CESID, said that turnout was 40.9 per cent by 5pm, with only a small number of incidents. “For the past three or four hours we have not had a single irregularity to report,” said Djordje Vukovic from CESID. He added that the number of incidents and irregularities was the lowest he had seen in 20 years of monitoring elections in Serbia. 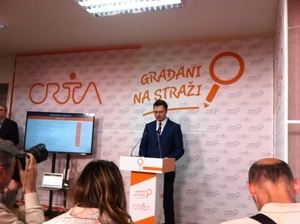 The Centre for Transparency, Research and Accountability, CRTA, an NGO that is monitoring the elections, told a press conference that no major irregularities had been reported. Observers noted that commissions sometimes did not check the personal documents of voters, and failed to check whether a voter had already cast their ballot, or to mark voters’ fingers with special ink to ensure they do not vote again. In three incidents, two in Leskovac and one in Novi Sad, observers found that voters were not able to cast ballot because someone had already voted instead of them. In five municipalities and towns, observers found people registering who had turned out to vote and who had not. “[All these incidents are] isolated cases that do not represent a trend that could endanger the regularity of the election process,” CRTA said. 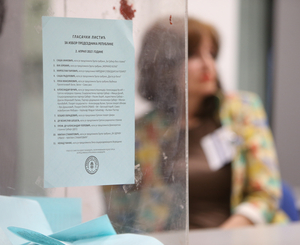 Members of the Ministry of Interior at Smederevo ordered one person into 48-hour detention on suspicion that he had destroyed voting material. The ministry announced that there were grounds for suspicion that the person had crumpled and torn a sheet from the electoral roll at one polling station. According to the State Electoral Commission, RIK, the turnout by 6pm was 46.32 per cent, not including Kosovo. The elections have continued without major irregularities. 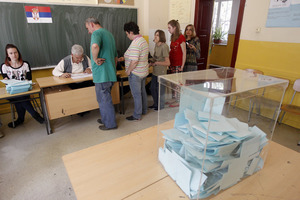 In central Serbia, turnout was 46.11 per cent, in the northern province of Vojvodina 46.5 and in Belgrade 49.12 per cent. In the presidential elections of 2012 the turnout by 6pm was 48.8 per cent. Djordje Vukovic from the Centre for Free Elections and Democracy, CESID, said he expected turnout for today's presidential elections to be about 53 per cent. "Having in mind trends in last four electoral processes, this is somewhat lower turnout, but we'll see how things develop," said Vukovic to N1 television. Polling stations in Serbia’s presidential elections closed at 8pm. The Serbian Electoral Committee said that the first results will be known around 10pm, while a report on irregularities is expected after the closure of polling stations. The Centre for Free Elections and Democracy, CESID, estimates the turnout at 50 per cent by 7pm. The polls closed at 8pm and CESID’s final estimate will be published later. According to the Centre for Transparency, Research and Accountability, CRTA, an NGO that is monitoring the elections, turnout by 7pm was 49.9 per cent - 3.2 per cent less than by the same time during 2016’s snap general elections. 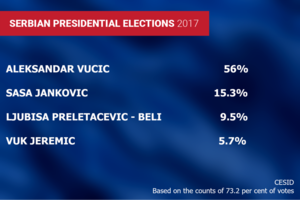 As a joke, Ljubisa Preletacevic Beli has announced his victory, claiming to have won more then 67 per cent of votes, saying he was unsatisfied with the results. According to the Centre for Transparency, Research and Accountability, CRTA, an NGO that is monitoring the elections, no major irregularities have been reported. In Leskovac, police intervened when an activist physically attacked the head of the electoral board, as well as in Pancevo where members of extremist groups gathered in front one of the polling stations. CRTA also noted that in Zajecar, Knjazevac and Ali Bunar, police stations were open in order to urgently issue voters with certificates that they have filed requests for new ID cards, which will enable those without valid IDs to vote. In Ali Bunar, a group of 50 people went to police stations to get certificates. CRTA noted irregularities in 3 per cent of polling stations, including that commissions sometimes did not check the personal documents of voters, failed to check whether a voter had already cast their ballot, and failed to mark voters’ fingers with special ink to ensure they do not vote again. A spokesman for the team of presidential candidate Vuk Jeremic Nikola Jovanovic said that they expect that the final turnout in the presidential election will be 57 per cent, and added that election day was marked by numerous irregularities. Jovanovic said that Jeremic's team would not allow election fraud and would file objections to Serbian Electoral Commission. Presidential candidate of the ruling coalition Aleksandar Vucic issued a short comment this evening. He said: “We stand better then you think,” Tanjug news agency reports. A senior official of the ruling Serbian Progressive Party, Nebojsa Stefanovic, has said that, according to their data, turnout for today's presidential elections was 55.5 per cent. At the press conference, Stefanovic accused the opposition for telling "numerous lies" during election day. A representative of the opposition candidate Sasa Jankovic’s team said that they expect to win the presidential election, despite the fight being unfair and marred by irregularities. 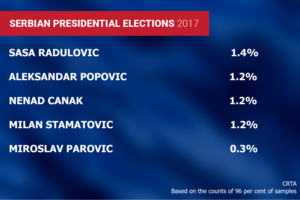 In its first announcement since the polls closed at 8pm, Jankovic’s team did not issue any estimates of turnout or the number of votes that each candidate received. 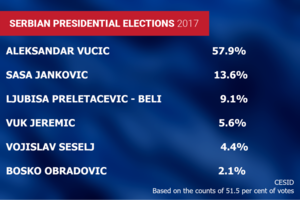 CESID, an NGO that is monitoring the elections, announced that based on the counts of 51.5 per cent of votes, Aleksandar Vucic won 58.5 per cent of votes, Sasa Jankovic 13,6 per cent, Ljubisa Preletacevic - Beli 9.1 per cent, while Vuk Jeremic won 5,6 per cent of votes. Serbian Progressive Party in Novi Sad is celebrating the victory of Aleksandar Vucic with fireworks and trumpets. “While KFOR static and mobile presence was guaranteed in vicinity of the eight most important collection centres identified by OSCE, coordination with the Kosovo police, EULEX, and OSCE was excellent. “In accordance with its current mandate, KFOR continues to act impartially, prudently and firmly to contribute to the maintenance of a safe and secure environment for all the people of Kosovo,” the statement writes. Addressing the press conference at the headquarters of the ruling Progressive Party, Aleksandar Vucic said he was proud of the support he received and that election results showed which direction Serbia wants to go. “It’s important that the win was as clear as a tear. I got 12 per cent more votes then all the other candidates together. 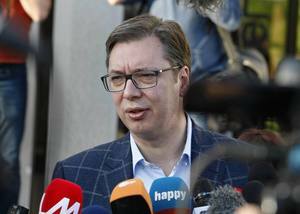 “When you have results like this, there is no instability – Serbia is strong and it will be even stronger,” Vucic said. Irregularities were noticed at 3 per cent of polling stations for Serbia’s presidential election on Sunday, but did not influence the final result, according to Rasa Nedeljkov, programme director of the Centre for Transparency, Research and Accountability, CRTA. Nedeljkov said that the number of citizens who experienced a troublesome voting process was minor, and that the biggest problem on election day was the turnout, with 54.2% of eligible voters casting a ballot. According to Nedeljkov, the voter turnout was the result of a decrease in citizens’ trust in the work of the country’s intuitions. 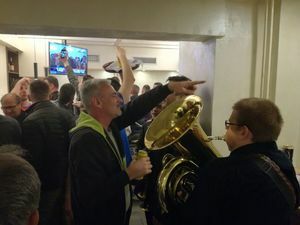 CRTA had 900 watchers in 450 polling stations to monitor the polls on April 2, which the ruling Progressive Party candidate Aleksandar Vucic has won based on the 91.29 per cent of votes that have been counted. 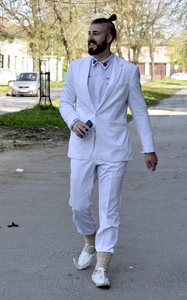 The final results of the election should be confirmed by the State Electoral Commission, RIK, by April 5.